THE CK-7 MAY BE AVAILABLE AS PRE-OWNED / RECERTIFIED AT A GREAT SAVINGS. PLEASE CALL FOR AVAILABILITY. "CK-1R2. This Music/Message On Hold adapter unit connects to any one of your telephones and provides Music-On-Hold capibility for all of your compatible phones. With the CK-7, you now have an audio input to provide you with seamless "HOLD" button activated message/music on hold when used with your favorite player or audio source. It doesn't matter how many phones you have, one CK-7 Music On Hold unit will work with all of them. This "wall mounted" unit works automatically in the background every time you press the HOLD button on any of your corded/cordless models listed above. This unit lets your message sound its best "On-Hold" from Cassette Players, CD Players, PP Players, PC Sound Card Output, or any Powers Productions Digital Player (including our Pre-owned models. NOTE: An expernal audio player is required to feed Message On Hold audio into the CK-7. Please call us for ideas and pricing.)... 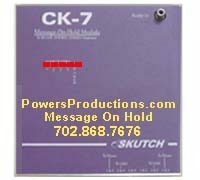 The CK-7 Music/Message On Hold unit is much better than most any other telephone Music On Hold adapter currently on the market, short of buying an expensive telephone KEY system (PBX/KSU). Note: The RCA/GE telephone (pictured) DOES NOT COME WITH THE Skutch CK-7 interface!! We are using the image of this phone as a reference of one you may have.